(Nanowerk News) Researchers, clinicians, health educators and policy makers all gathered on May 4th in Sao Paulo, Brazil, as the new Multidisciplinary Centre for Research into Obesity and Related Comorbidities (Cepid-OCRC) was opened at da Universidade Estadual de Campinas (UNICAMP). At the heart of the new facility is a 3D imaging laboratory with a Bruker PET/SPECT/CT imaging system. Funds for the purchase of the laboratory systems were provided by the government-backed FAPESP research foundation, a body that supports fundamental and applied research projects as well as backing the development of the required infrastructure. 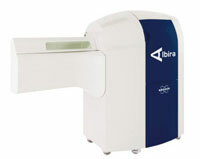 Bruker's PET SPECT CT system The new facility houses a latest generation Albira trimodal preclinical imaging instrument from Bruker. This revolutionary system features high resolution and superior image quality, and its rapid multimodal acquisition and reconstruction gives researchers a more complete picture and deeper insights into the causes and effects of disease. Pre-clinical imaging is playing a growing role in the study of a wide range of diseases; by providing 3D molecular images in vivo researchers in, for example, oncology, cardiology, orthopedics, neurology, metabolism studies and new pharmaceuticals can advance their understanding of the fundamental basis of disease. Licio Augusto Velloso, the FCM researcher and coordinator of Cepid-OCRC, explained: "Because preclinical imaging procedures are not invasive we can follow a subject over a long period of time, significantly reducing the number of animals needed for our research. In addition, the equipment will enable the integration of basic research with translational and clinical findings. This will bring considerable advances in improving the diagnosis and treatment of human diseases." The focus of the Cepid-OCRC is to provide the core facilities that allow basic, translational and clinical research, integrate a multidisciplinary team of investigators to collaboratively address critical research questions and create new possibilities for diagnosis and treatment of obesity. Furthermore, the center will be a focus for educating the next generation of scientists and investigators in the field. The Coordinator of the Clinical Research Center (CPC) of FCM, Andrei Carvalho Sposito, said: “the inauguration of the lab and the installation of the equipment will promote closer integration among researchers at UNICAMP and deliver greater international impact of research produced by the institution.” The Coordinator of the postgraduate Committee of the FCM, Rosana Onocko Fields, representing FCM Director Ivan Felizardo Contrera Toro and the Associate Director of College Roberto Teixeira Mendes, added: “This moment marks a fruitful partnership with FAPESP.” A view echoed by the words of the Scientific Director of FAPESP, Carlos Henrique de Brito Cruz, who said: “A thriving center needs all the right ingredients – security to offer long research contracts to the best staff, and the ability to invest in equipment that is required is also important."